Share it, too, if you agree! And, when you do, share your own story of a Millennial you know making an impact! I’m endlessly fascinated by people who communicate in new or different ways. 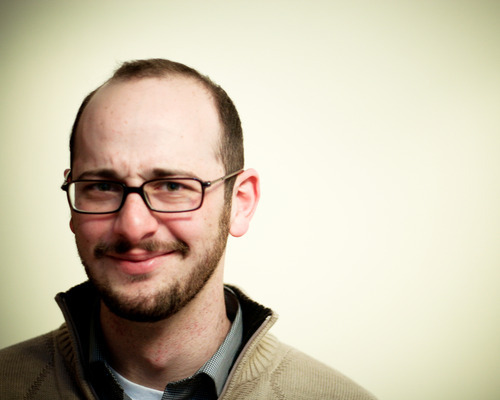 Josh Gondelman, a writer and comedian based in NYC, decided earlier this year to send a postcard to anyone who wanted one because he loves letter-writing. My friend Barry told me about it, and of course I eat these things up. I signed up and promptly forgot about it, and then got a wonderfully hilarious mystery postcard in the mail a few months later. It took me a whole night to figure out who Josh was, and that in and of itself was lots of fun. Then, I interviewed him. Jen Bokoff: From whom and where was the first postcard you ever received? Josh Gondelman: I don’t remember exactly the first postcard I ever got, but my grandmother, my dad’s mother, used to travel all around the world when I was younger, and so we’d get postcards from Russia and Greece and China. I don’t remember whether Antarctica has a post office for commercial use. Sometimes the mail took longer than my grandmother to get back to America, which was confusing to little me. I thought she was faking the cards and just sending them from her house, because I’d already seen her. 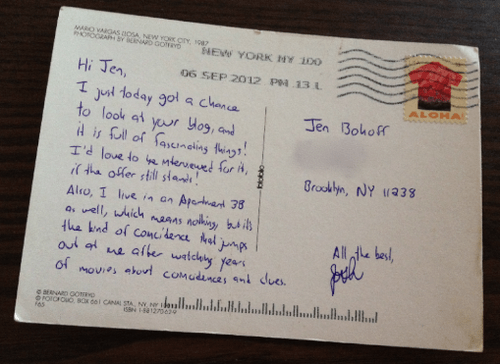 JB: Have you ever developed relationships beyond just a few interactions by sending random people postcards? JB: You have nice handwriting. Do you think that’s becoming rarer as typing becomes more common? JG: Oh gosh! Thanks! I do imagine probably people are less proficient at writing by hand now than they used to be. You must have received one of my early in the morning postcards. If I write a whole bunch in a day, by the end it’s just a lunatic scrawl. I try not to be a dinosaur and sob about how the decline of handwriting indicates a larger societal problem. On the other hand, it’s off-putting when someone writes down a takeout order, and it looks like something out of a serial killer’s diary. JB: What’s the most memorable postcard you’ve ever sent? JG: One guy requested that I write to him with my thoughts on medical marijuana, and I wrote back: “I think they should legalize pot but outlaw white guys with dreadlocks.” That was pretty succinct. I felt like I got it just right. JB: Do you write other things besides letters and your tumblr? JG: I do! I’m always writing for my standup act, and I write a lot of humor type pieces for Thought Catalog. Right now I’m actually working on a proposal for a memoirish book about this postcard project. So we’ll see if that becomes anything. It’s very exciting to think that anyone might want to read that! Ideally I’d love to get it so my job is some triangulation of standup, prose writing, and tv writing. We’ll see if I make it there! Check out Josh’s blog featuring many of his postcards, his humor writing, and everything else (including his upcoming performances). As three rodents with defective visual perception? Flesch Score = 0. This is why Three Blind Mice was written as it was and NOT like this! by Eric Newton of the Knight Foundation, as shared in Clarity for Charities by Big Duck. Great article. I do tend to be an anxious fellow and I do tend to see the world as a little darker than perhaps it genuinely is, but I also do appreciate much more than a rosy scenario, I appreciate straight news. I appreciate honesty. I appreciate confronting something head on and being given all the details first — and then responding to them in whatever way I might. At best, it simply confirmed who I am to myself. It helps me. For me, it works. David Rakoff, November 27, 1964 – August 9, 2012, in a Fresh Air interview in 2010. I feel very lucky to have gotten to see, hear, and feel his brilliance recently at the This American Life live show. People don’t get heard as much as they’d like. It was a great realization for me as a writer that people really want to be listened to. They are surprised that someone is interested, really interested. And you have to really want to hear somebody. A big part of it is tapping people’s natural desire to be listened to, especially since they know they’ll never have to deal with you again. It’s the same principle that underlies therapy, confession, conversations with strangers on airplanes: it’s a kind of duty-free intimacy that people really crave. If you can provide it without tricking people — because it’s not duty-free; it gets published — you can tap into that incredible appetite. It’s more appealing to talk with someone you’ll never know. It’s almost like talking out loud to yourself. And there is no limit to how unnoticed people feel by the media. It’s just the nature of what is considered newsworthy. If a person is living a life that is not newsworthy, it’s appealing to have someone say, “I want to hear your story.” Most people say, “Really, really? You really want to hear?” And people have amazing stories. Job Hunting, Children’s Book Style! You Can Do It, Bunny! 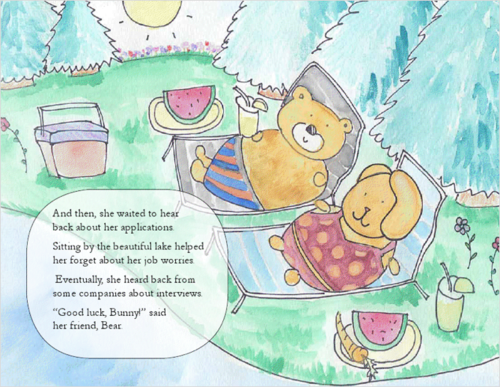 is a fun and encouraging tale about staying positive while job-hunting, starring cute and endearing animals. Bunny is a recent graduate from Animal School. She’s smart, capable, and determined. However, she is not totally sure what the right job for her is. On top of that, the economy is very bad in Animal World, making each job she applies for very competitive. 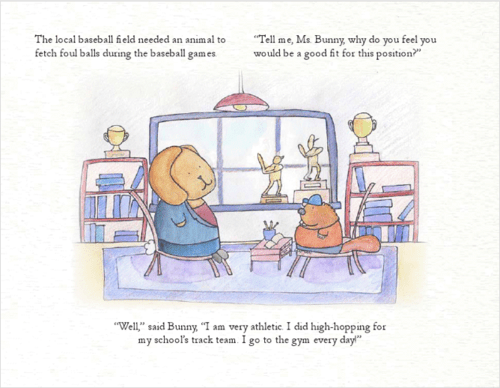 With persistence, determination, and the support of her awesome friends and family, Bunny will find a creative solution to her problem of finding the right job despite the poor economy … though it might take a little bit more time and trial and error than she was expecting. 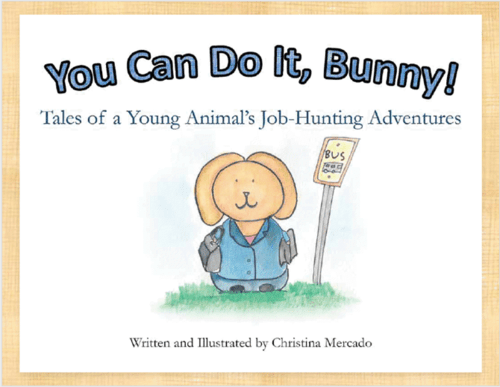 This adorable book written and illustrated by fellow Tufts Jumbo Tina Mercado is relevant, fun, and encouraging for a recent grad or friend who’s just not scoring their dream position. I like how this book takes the seriously stressful situations of unemployment and rejection and simplifies them to something manageable. There’s even a happy ending, though I won’t say any more than that!